I have something exciting to share with you today! I am so proud of my brother for the release of his new book, All Parents Must Go!, I know you are going to love it!! It is beautifully illustrated and it has such a fun story that my boys absolutely loved. 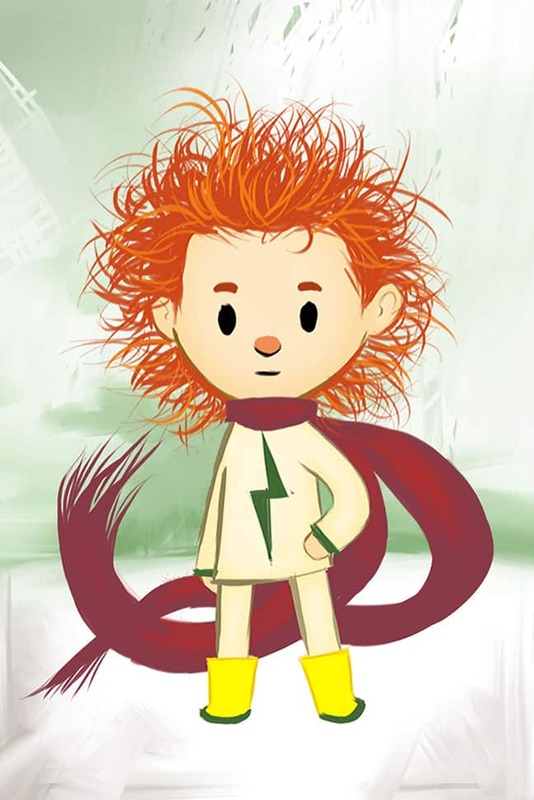 It tells the story of a town where its kids decide to trade their parents for their “iPads”. The best part about it though is that they get rid of their parents by piling them into a rocket ship and blasting them over the mountain to live on a beach by themselves. 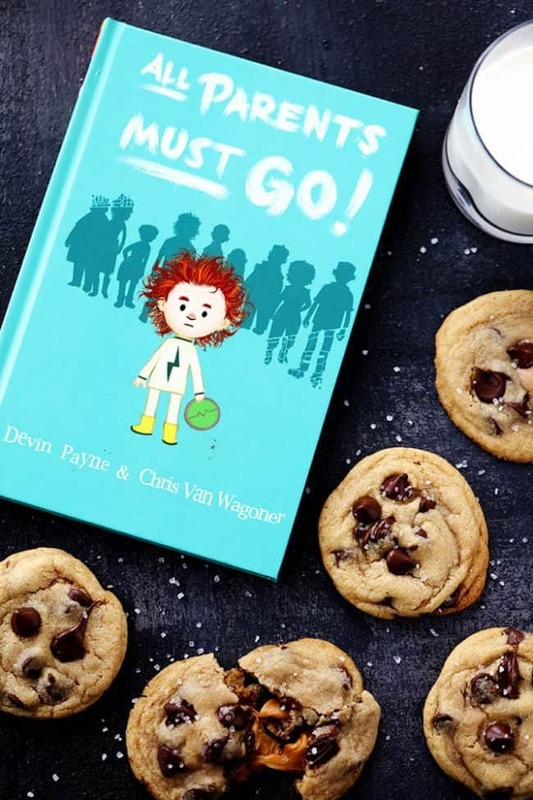 So after finishing the book I thought “If everyone’s parents were banished, what would kids eat?” So today I’ll be sharing a quick and easy cookie recipe that my boys would probably end up living off of if they were the characters in this fun book. 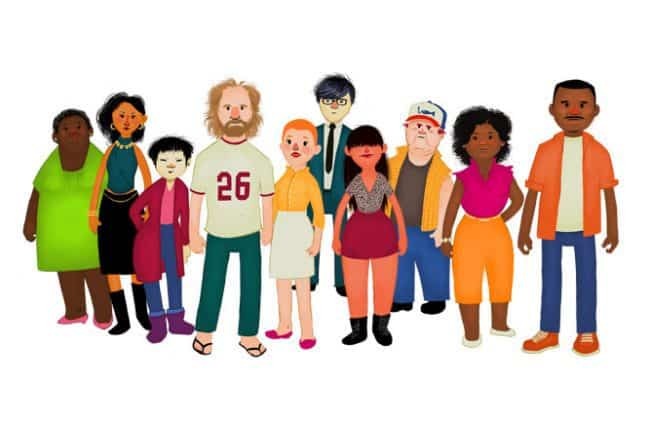 Aren’t the illustrations incredible!?? My brother is amazing! When I tell you that these cookies are the best that you will eat, it is no lie! It took me three batches to perfect these cookies but I promise they are perfect. 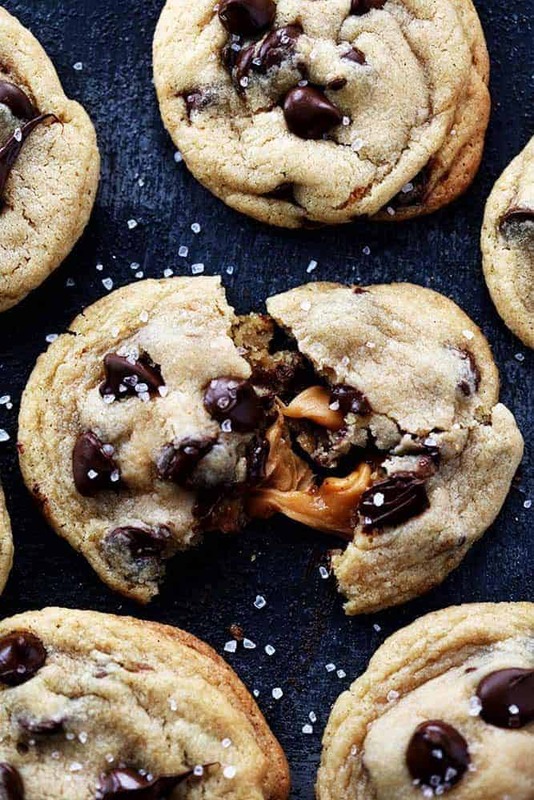 The most soft and chewy chocolate chip cookie gets stuffed with ooey gooey caramel and sprinkled with sea salt. What is not to love? I know that this is a recipe that you will want to make again and again. They are great for a nice warm treat with a tall glass of milk while snuggling up and reading All Parents Must Go! Salted Caramel Stuffed Chocolate Chip Cookies are the most perfect and soft chocolate chip cookies stuffed with ooey gooey caramel and topped with sea salt! In a medium bowl whisk the flour, baking soda, cornstarch and salt. In another medium bowl or stand mixer add the butter, and sugars and beats until fluffy. Add the egg and vanilla and beat until incorporated. Add the wet ingredients to the dry ingredients and combine. Fold in chocolate chips. Roll about 2 tablespoons of the cookie dough into a ball. Add one caramel into the center and fold the dough over the caramel and form a ball. Place onto the cookie sheet. Bake for 8-10 minutes or until they are lightly golden brown. Remove from the oven and let rest for 10 minutes. Sprinkle with sea salt. Transfer to a wire rack to cool completely. ** If using kraft caramels, you will need to serve the cookies warm or reheat the cookies to soften the caramel if they completely cool. If you use Rolos, the caramel will stay soft. I highly recommend All Parents Must Go! It is is seriously one of the funnest books I have read, and teaches the lesson of how important it is for kids to get away from their devices once in a while. Even more than that, it shows that kids and parents coming together to help each other is an important part of being happy. ?? Save 14% on All Parents Must Go today at Barnes and Noble! You won’t regret it! 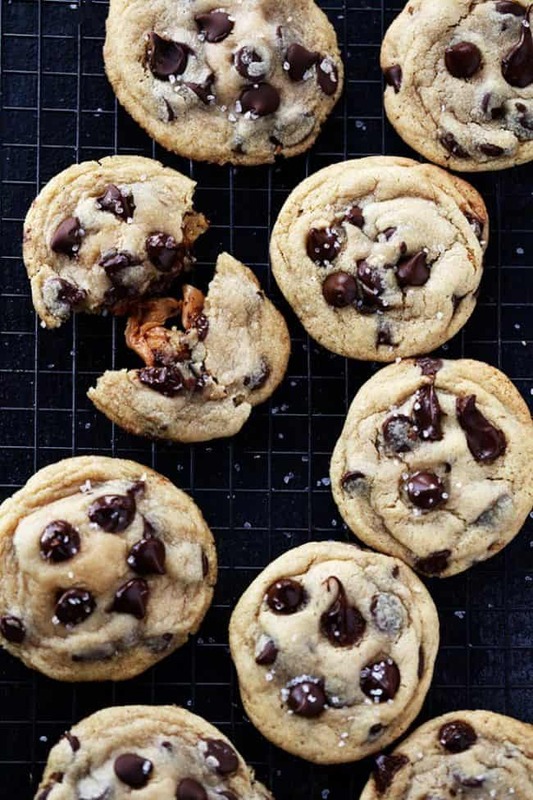 Such a delicious recipe, I love chocolate chip cookies and stuffed with caramel even more! I have to say please don’t stop sharing this yummy recipes since I am following from now on and going to added to my web! What are Rolo chewy caramels? Is it the same thing as a Rolo? My daughter loves chocolate included recipes very much. This recipe looks great and will surely be an addition to my daughter’s recipe collection. hey girl- this looks like a great book! And those cookies look amazing! yummy! 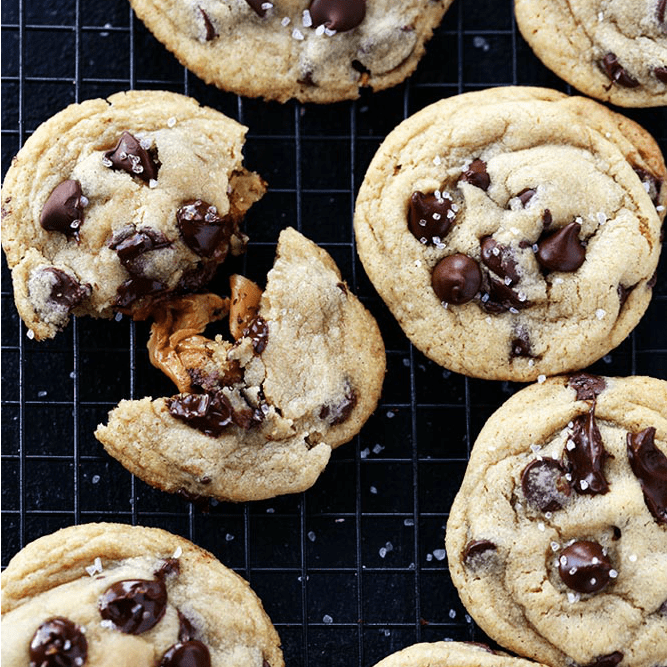 I love making cookies and also combining sea salt with chocolate so I can’t wait to make these! These cookies are the best I’ve ever made! I sprinkled Salted Caramel Sugar on top of mine. I also used Rolos. They are out of this world!!! Aren’t they awesome!?? I am so glad you liked them! I like to make brown butter first, let it cool to room temperature, then add it back in. Gives you an even more intense caramel flavor! Liked the recipe, made the recipe, others loved the cookies! Will make again, thanks for posting it! I used soft Werther caramels and this recipe was the best ever!! !